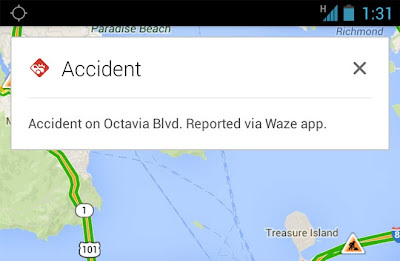 Two months ago, Google acquired a community-based traffic and navigation App called - 'Waze'. 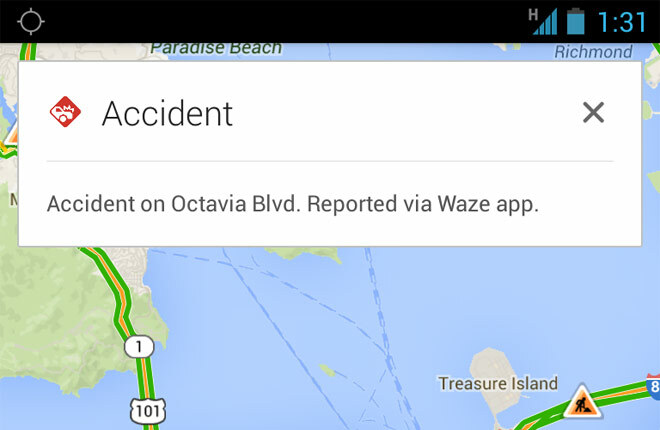 With the help of this recently acquired Waze, Google's Map now supports real time incident reports. The report will appear directly on Google Maps from the reports submitted by Waze users although this feature is not yet available everywhere, we know the terms & condition that guides the usage of such Apps. If you are an Android or iOS user and you are from any of the countries listed below then you have the opportunity to use this great feature and get real time updates like the one in the picture above, other featured updates include Construction, Road closure and Other important traffic-related updates. However, Google Maps is not the only App that benefits from the collaboration of Google and Waze. The Waze App has been updated as well which means that Waze users can also enjoy Google Search, Google Street View and Satellite Imagery from their Waze App. If you've not been using the Google Maps and Waze App, its better you start using them so that you wont get lost one day :-) (winks). You can download Google Maps & Waze for Android and iOS by clicking on the download link below.